A couple of weeks ago, a business-like email from the Royal Opera's press office announced the withdrawal of German soprano Anja Harteros from Suor Angelica, the central opera of Puccini's Il Trittico. No reason was given, but one could almost hear a collective sigh of disappointment. As an appropriately grand season opener, though, and as a two-thirds-new production, there were still plenty of star turns left in this show, and we saw a very impressive performance from Harteros's replacement, Ermonela Jaho. Best of all, though, there was a sense, under Antonio Pappano's baton, of the sort of team work that renders such talk irrelevant. There was also the intriguing question of how Richard Jones, who had already brought his characteristically sharp wit and eye to Gianni Schicchi, would deal with the first two operas in Puccini's tryptich, traditionally viewed as more problematic: the meaty verismo grimness of Il Tabbaro and the dubious religiosity of Suor Angelica. He opts to play one reasonably straight, the other brilliantly against the grain. Both are updated to somewhere in the mid-twentieth century, and Ultz's design for Il tabarro places Michele's barge firmly centre stage, sitting implaccably upon the 'Lady Seine', which Puccini was keen to have as the 'true protagonist of the drama'. Behind are the quay and a pair of brick buildings, with a passage between them from which a few extras appear at key moments—it's all, typically, keenly observed and carefully choreographed. A large grappling hook whisks some gnarly looking metal skywards early on, the grim drudgery of the workers' daily grind brilliantly evoked. 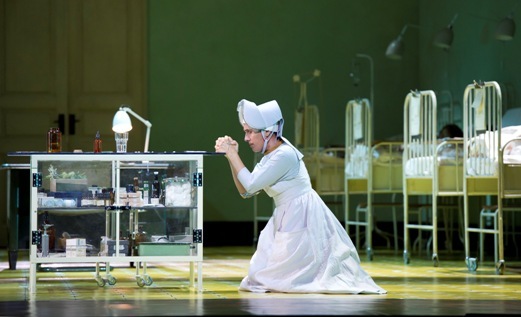 Lucio Gallo makes a wiry, threatening Michele, but cannot, with his dry-ish timbre and tendency to go under the note when singing below forte, quite match the security of Eva-Maria Westbroek's Giorgetta or Aleksandrs Antonenko's Luigi. Westbroek's gleaming soprano was a constant pleasure, at once both creamy and steely, and a single off-target top note served primarily to underline her security elsewhere. We could have done without some of her dancing (with the inevitable Anna Nicole flashbacks), perhaps, and I did wonder if she just seems too wholesome to fit into this dingy context, but she acted fearlessly and with well observed detail. Antonenko, making his ROH debut, had a bit of a shouty start, but soon settled, demonstrating a hugely impressive voice – big, burnished, if a touch short on bite – allied to good musical sense and solid acting. His Otello later in the season is something to look forward to, with or without the scheduled Harteros. Jones's Tabarro is played more or less as the libretto suggests, then, and no worse for it. But Suor Angelica was always going to present the most intriguing prospect. It seemed unlikely that the director would buy into the work's miraculous conclusion; but what would he give us in its place? The answer is a brilliantly dramatic vision of the piece, powerfully and persuasively realised for the secular age. Gone are the picturesque chapel and cloisters, garden and cypresses specified in the libretto, replaced in Miriam Buether clinical designs with the large ward of a children's hospital run by nuns. It's the sort of institution that has become something of a Jones trademark, and we have prim rows of beds running down either side, lights dangling from the ceiling and, for Angelica's confrontation with the zia principessa, a wall with door and large window descending to create a seperate space at the front of the stage. I admit to having doubts at first. Wouldn't the nuns' daily contact with all these children – some, it must be said, better behaved than others – dilute Angelica's focus on her own abandoned child? 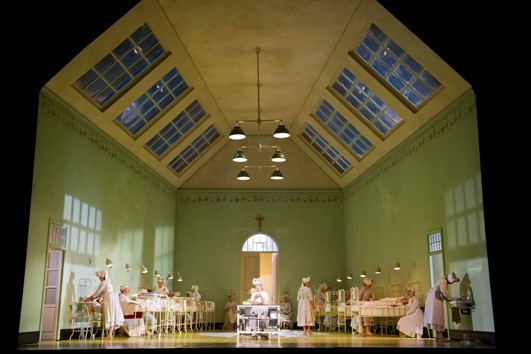 Wouldn't there be too much dissonance between the libretto's piety and miracle-soaked setting and the sterilised atmosphere of this institution? It says a great deal for Jones's direction that these questions soon dissolved. It says, too, a great deal for the unflinching commitment of Jaho's Angelica. Her grief was powerfully evoked, her slight frame shaking harrowingly to the detriment of vocal beauty. Her matter-of-fact suicide took no risks, employing a cocktail of pharmaceuticals rather than the airy-fairy herbal solution prescribed by the libretto. Her final 'vision', meanwhile, was staged as a brief, heartbreaking mad scene quickly unveiled as illusory. Jaho's voice is less sharply focused than ideal, lacking a steely core and tiring towards the close, but this was a powerful, bravely complete performance. Anna Larsson's dignified but ruthless Princess was marvellous, too, replete with a Cruella DeVille-style white streak in her hair and dead animal draped over her arm. The rest of the extended cast was also very fine, directed with sharp detail. 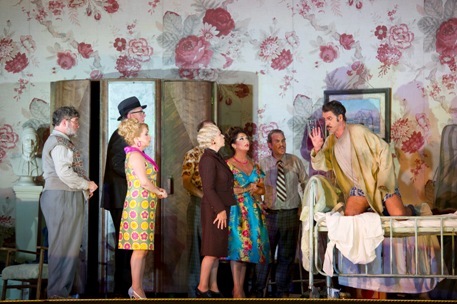 Jones's Gianni Schicchi is, of course, a known quantity. Smartly updated to the 1950s, and with the comedy laid on thick and fast, it has already been seen a few times since its 2007 unveiling, presented as a double bill with Ravel's L'heure espagnole. It's fresher than ever, though, and benefits greatly from being seen in its original context. Gallo steps into shoes previously inhabited by Thomas Allen and Bryn Terfel but needn't fear too much by comparison. Once again, the performance was not vocally perfect, but he's got a fine comic touch, and gives the character an interesting, slightly malicious edge. Francesco Demuro, making his ROH debut, was a wonderfully lyrical and ardent Rinuccio, all flashing smiles and twinkling eyes, only let down by some over-enthusiastic pushing in his mini-aria. Ekaterina Siurina was charming as Lauretta, even if we could have done with a smoother transition into 'O mio babbino caro'. But it was as a brilliantly tight ensemble effort that the performance was most to be admired, with turns from Elena Zilio (Zita here, and a slightly fruity Monitress in Suor Angelica), an evergreen Gwynne Howell (Simone), Robert Poulton (Marco), Rebecca Evans (Nella) and Jeremy White (Betto). Finally, there can only be praise for Antonio Pappano's conducting. No detail of Puccini's wonderful scores – a mixture of mellow, slow burning passions, warm humanity and easy compositional virtuosity – passed us by, and each work was beautifully paced, controlled with a natural ebb and flow. The playing of the Orchestra of the Royal Opera House was glorious, too. It's a great start to the season, and, given the cost of staging Il trittico, it would be a risky gamble not to try and see it this time round. There's consolation, at least, for those who can't: the production is being filmed for cinema and DVD release, and will be broadcast on Radio 3 on 17 September.